The Stork Nativity's five layers feature angels, magi, shepherds and shepherdesses, sheep, a dog — and a stork. Five layers create a marvelous 3D look. The rare vintage sheet of the Stork Nativity contains over 30 wonderful images. While it wasn't possible to include all the woolly sheep, for example, a goat, donkey, cow, sheep, dog, a duck and a stork are featured in this Premium Download. 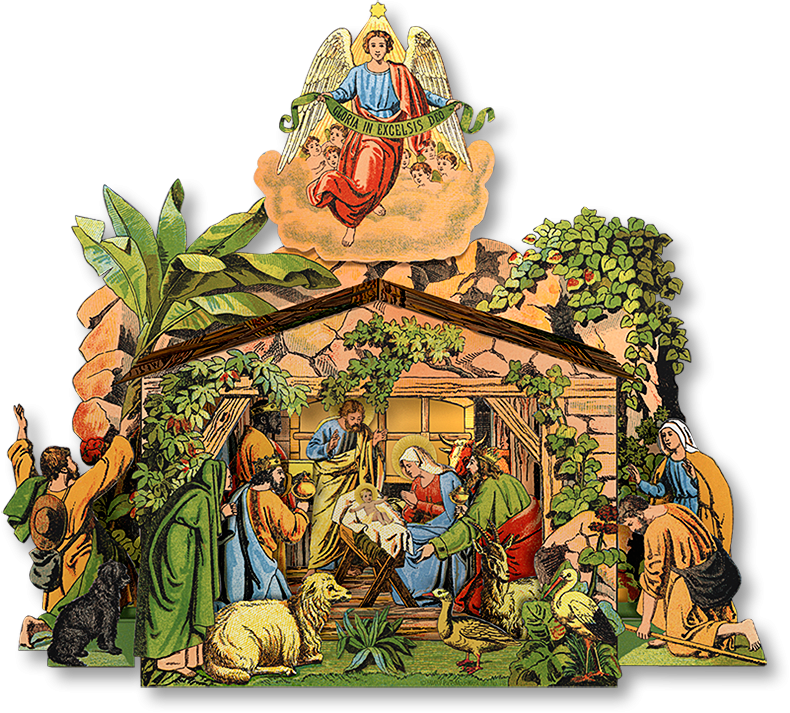 In addition, shepherds and shepherdesses, magi, and angels surround the Nativity which is housed in a manger covered by a slopping roof. It took five layers to place all the wonderful figures of the Stork Nativity, and the 3D effect is marvelous, as you can see from the closeup at left. But don't let "five layers" make you think, even for a moment, that assembly might be anything other than simple. Top view showing the construction of the Stork Nativity. As you can see from the photo below left, the three layers that include the magi and the Mother and Child slip through slots in the side walls. On the tabs of the first two of these layers are attached, at left, the dog and shepherd, and at right, the kneeling shepherd and the shepherdess. Then the side wall tabs are inserted into manger slots and locked. Likewise, the roof snaps into corresponding manger slots, and the angel is attached. 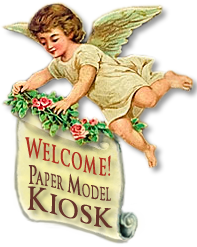 Print the Stork Nativity Premium Download — a PDF of four 11 x 8.5 pages — as many times as you wish. Assembling the Stork Nativity is a snap: just insert tabs into slots and lock them together with a gentle downward motion. Step-by-step instructions are included, nevertheless! Size: 11 x 10.25 x 2.75 inches. 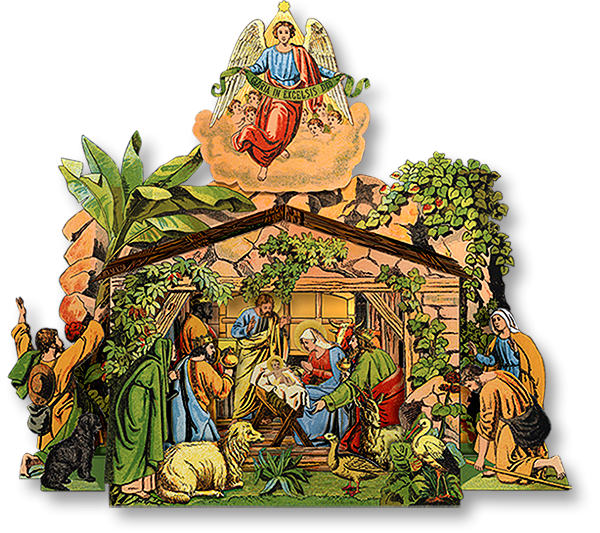 A large size, two-page, vintage nativity sheet like the one that inspired this crèche was recently sold for $250. Buy Stork Nativity as part of a collection, and save!